Google just announced Project Tango yesterday and now we're getting our first looks at just what a 3D scanning smartphone can do. TechCrunch got its hands a new video by Matterport showing a real 3D indoor map of a room captured with one of Google's prototype devices. If you've never heard of Matterport before, it's a computer vision solutions company that creates maps and 3D room reconstructions. Matterport gave Google's Project Tango a whirl and was able to capture the color camera data with a complete 3D mesh of a room at the same time. The resulting 3D image was accurate enough to measure the height from floor to ceiling - and map all the cluttered objects in the room. What's more, the 3D map is interactive. Users will be able to zoom in, pan and rotate the image to explore a three-dimensional digital environment. While the 3D sensing company has built cameras of its own in the past, it said Project Tango was more than capable. Matterport was impressed with how 3D mapping on mobile devices has become a far more viable capture platform than most people following the tech expected. The only knock Matterport CEO Bill Brown had against Project Tango was the slightly cruder 3D model it produced. But this is due in part to the 4MP sensor on the current prototype and he believes that it can easily be fixed with a higher resolution camera. 3D scanning has been a technology relegated to only robotic vision studies, self-driving cars and tech labs. The arrival of the Microsoft Kinect allowed more software tinkerers to experiment with depth sensing. 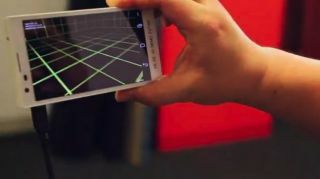 By adding 3D sensing to mobile phones, Project Tango could open up 3D scanning and depth sensing technology to even more everyday applications including gaming, helping the visually-impaired get around and maps and navigation. Phone 3D motion gaming could be the future but what's its like on the Xbox One's second generation Kinect?